In theory, infill housing is a great idea. You have a vacant or underutilized lot in an established neighborhood, and a visionary property owner or developer comes in and builds a new home in that spot. Among other things, infill housing maintains the density of established neighborhoods, increases property values around it, and prevents sprawl. This is good, right? Of course it is. However, the quality of the design and construction of infill varies widely, and you can see evidence of this throughout St. Louis. Ranging from cheaply-built cookie-cutter McMansions that are grossly oversized for their lots to thoughtfully-designed, eco-friendly contemporary homes that complement their neighbors, St. Louis has it all. 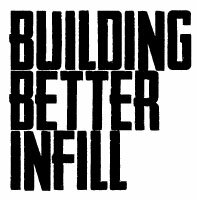 Next month, City Affair and NextSTL will present “Building Better Infill,” a punchy discussion and slide show on the good, bad and ugly of local urban infill on Thursday, December 6th at 7 PM at our studio at 4168 Manchester. Presenters include Brent Crittenden and Sarah Gibson from UIC, our very own Jeremy Clagett and Tom Niemeier from SPACE, and Randy Rhoads from McCormack Baron Salazar. The event is free, and Urban Chestnut is sending over some beer to help us concentrate on infill. Hope you can make it. Download a pdf flyer of the event here.